Tim, a 54-year-old Army veteran lives in West Virginia. He takes medications for arthritis, COPD and chronic pancreatitis and is seeking treatment for Post-Traumatic Stress Disorder (PTSD). In addition, his missing and broken teeth caused severe pain and limited his ability to eat, resulting in a weight loss of 17 pounds within a few months. Living on a fixed social security disability income, Tim could not afford the dental care he desperately needed. 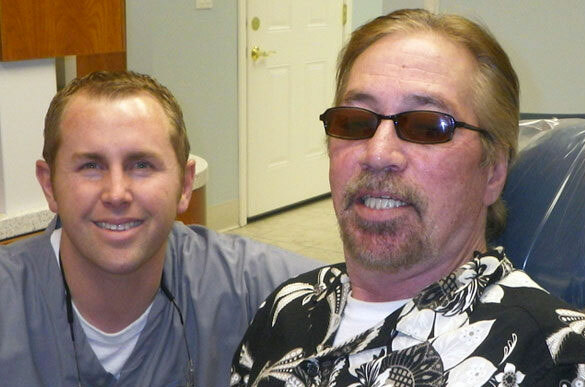 While he is able to get medical care through the VA, the dental treatment he needed was not covered. Thankfully, the VA referred Tim to the DDS program, and he was linked with two generous volunteers who agreed to help. Thanks to Dr. Dallas Nibert and Bite-Rite Dental Lab – volunteers for Dental Lifeline Network’s Donated Dental Services (DDS) program Tim now has the ability to eat and chew properly.